It should be clear now that Mitt Romney ran for US Senate to block Trump. Three Republican Senators say they will vote against former Godfather’s Pizza CEO Herman Cain for the Federal Reserve Board. 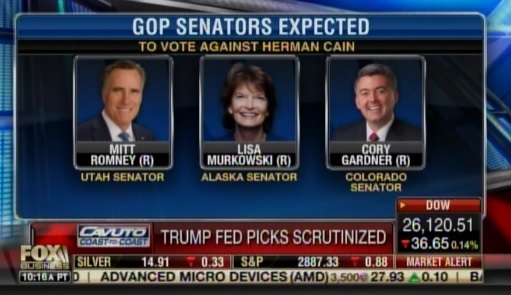 Mitt Romney, Lisa Murkowski and Cory Gardner will not vote for Herman Cain. Romney jumped in to take Jeff Flake’s place.